Once the mankind invented the wheel, it immediately started thinking of more special transports to move around the Earth. Today you can still travel horseback to camelback, take a high speed train or jet aircraft, or take one of these 15 incredible transports you may have never imagined. Simple floating rafts made of polished pork skins have been used in China for centuries. Yet, you can still ride one in the remote rural regions along the the Yanzte River! Tünel funicular in Istanbul is the second oldest underground transportation in the world, after the London’s tube. The 573 meters tunnel with two station was opened to the public on January 17, 1875 and is still in function today! The trip in a fancy red carriage from Karaköy quarter to Beyoğlu will take just 1.5 minutes! These funky reed boats are among the oldest known types of boats known to the world! Today, totora boats are still in use among indigenous people living on the floating islands of Titicaca Lake (which are also made of totora reed). The boats vary in size from tiny fishing canoes to thirty meters long vessels! Traditionally shaped with a dragon head on the bow of the boat to ward off evil spirits. Is it a bus or is it a train? It doesn’t matter much as the route goes through jaw dropping Andian scenery from Plaza Grande, in Quito, to Hacienda San Augustin, near Cotopaxi volcano! Unfortunately, the local officials banned the route a few years ago due to safety concerns. Yet, you can still ride las chivas at the rural roads of Colombia, Bolivia, Venezuela and a few regions of Ecuador. Make sure you know how to work with your elbows as the bus-trains are usually loaded front-to-back and floor-to-ceiling with: packages of bananas, coffee, chickens, pigs, dogs, cows, cats, and people. Now Mikrolet blue minivans can be seen in numerous Indonesian cities, however in Manado they’ve gotten to a way new level of awesomeness. Once it goes dark the drivers switch on all the neon and set the music out loud. Think really loud with huge woofing sub-buffers hidden under the last row of seats. The fair is less than 1$, making it the cheapest club on wheels I have ever seen. Amfibus is one of the main attractions in Rotterdam. Take a bus tour of the city for €24,50 and get splashed in the Maas River! Similar buses recently replaced River Clyde ferry crossing in Renfrew and Yoker, close to Glasgow City. Technically, it’s more like a square platform put on reused military tank wheels and equipped with an engine. Running between Phnom Penh and Battambang, the train is incredibly popular among the locals and primarly used for transporting all sort of stuff – from chickens to scooters. A transport for the true daredevils! How do you feel about taking a 2 kilometer ride down the crooked hill from Monte to Funchal neighborhood with a speed of 48 km/hour? For those who love relaxing travel, head to Klädesholmen or Mälaren in Stockholm! You can travel up to 15 knots on water while taking all sort of spa treatments and soaking your skin in a warm sauna! The notorious city of Medellin (former murder capital of the world, controlled by Pablo Escobar) is steadily becoming one of the most progressive urban cities in Colombia! 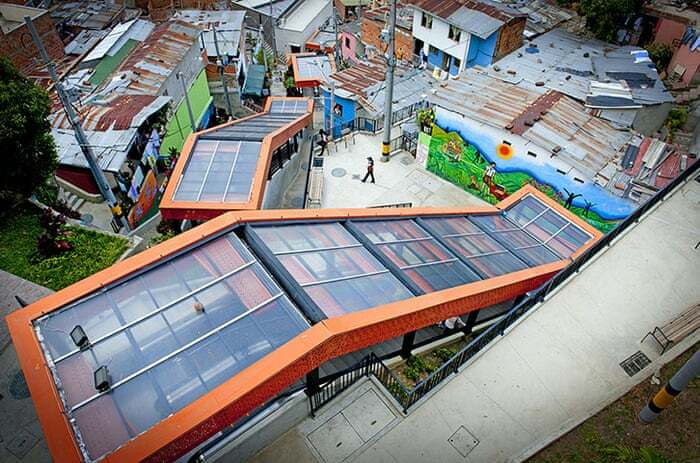 In 2011, the city opened a 85-meter long coveted escalator in Comuna Trece. Now the residents can travel up the hill to the newly built shopping area in just 6 minutes instead of taking an hour walk around the crooked lanes. You hate them or love them, but you can’t completely ignore them! Kitsch and loud jeepneys are everywhere around the Philippines. They vary in shape, size, and design, yet nearly always are tightly people-packed and driving at insane speed. Can you imagine, those used to be military jeeps during World War II? I love riding down the hill with wind whistling in my ears…but huffing and puffing up the hill doesn’t seem as fun to me. In Trondheim, you can use this awesome lift to get you all the way up to the top for free. Place your right foot on the starting point and keep the left foot on the bicycle pedal. After pushing the start button, a footplate emerges to get you pushed forward. Tangah are high-seated carriages on two big wheels, pulled by one or two horses. It is definitely not the most comfortable mean of transportation (or the fastest), but incredible fun guaranteed! Gracious dhow boats can often been seen around the Red Sea and Indian Ocean region. Originally, a traditional Arab sailing vessel, designed for transporting heavy items, like fruit, fish, people and cattle to the coasts of the Arabian Peninsula, Pakistan, India, today smaller dhows are used for fishing in the Indian Ocean all the way from Madagascar to the Bay of Bengal. These incredible basket boats, named as Thung Chai by the locals – are insanely valuable to their owners (mostly fishermen in central Vietnam). I wonder how difficult it is to sail a boat like that?